Who doesn't love water balloons? I know I did as a kid, and even as a mom, I love having water balloon fights with my kids! What I don't love is the filling and tying, and finding the itty bitty pieces in the yard when we are done. 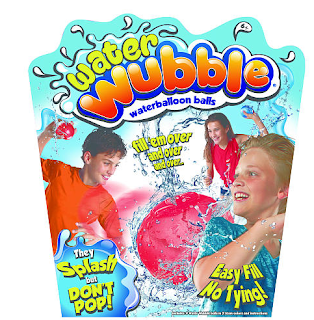 Water Wubble Waterballoon Balls are the new best way to have a water balloon fight! All you do is fill with water, push the end of the water balloon inside itself and you have a nice, big, FULL water balloon, that even the kids can refill themselves because they NEVER pop! Water Wubble Water Balloons come in a pack of 8, with 2 colors so you can play on teams!